Weather and Seasons Homeschool Unit! I didn’t even take pictures of half of the things we’ve already done! Here are some of the things we’ve done since last week that I have taken pictures of. I thought it’d be fun to show what my planning looks like. I typically sit at the computer with a stack of books and read and google and jot down ideas. So I’m just going to jump in with the pictures and explain a little bit about a few things we did so far. I love this project of drawing snowflake shapes with glue (on wax paper or foil) and then sprinkling glitter on top. Let the glue dry completely and then peel the snowflakes off. I found this idea online and in a book I have. I think we’ve all seen this idea in a thousand different places… cotton balls used to make clouds. We made a few different types of snowmen. One set using popcorn and one set using cotton balls and felt. We strung up a laundry line and the girls practiced hanging clothes. I made these felt bodies and the girls had fun dressing them up for the different weather. We used cotton balls as snow and the girls wore mittens while digging through looking for buried objects. We buried the same objects in sand and they used a shovel to find them. We talked a LOT about rain and water this week. Spring and rain and all the water experiments were the girls’ favorite part by far. We took an umbrella outside and used the hose to pretend to play in the rain. Another fraction game. Fractions are a current math time favorite around here. This was an activity to teach about adjectives and verbs. These are pictures of types of weather. I’d tell the girls a sentence and they’d pull out the right card. Like if I said, “I’m going outside and I’m bringing my umbrella.” They’d pull out the rainy card. After that I had them pick a card and tell me a sentence. Learning about plural words. When to use s, es, or ies. We also did quite a few writing lessons. The girls wrote an informative story, a story about a seasonal object, a story about a make believe outting in a certain weather type, and a diamonte poem. 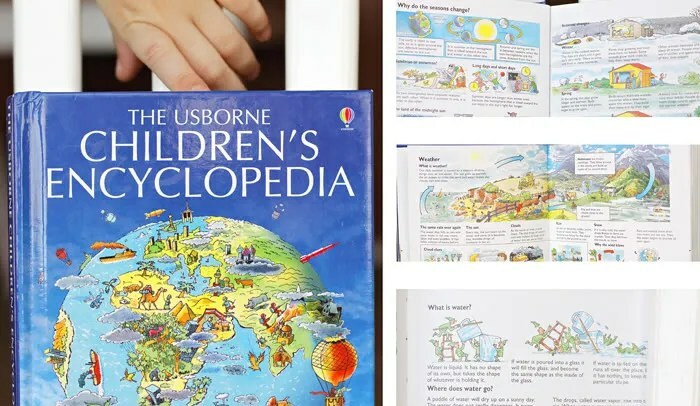 The Usborne book of Everyday Things. We also have been learning a couple of poems. And lots and lots of weather related songs. 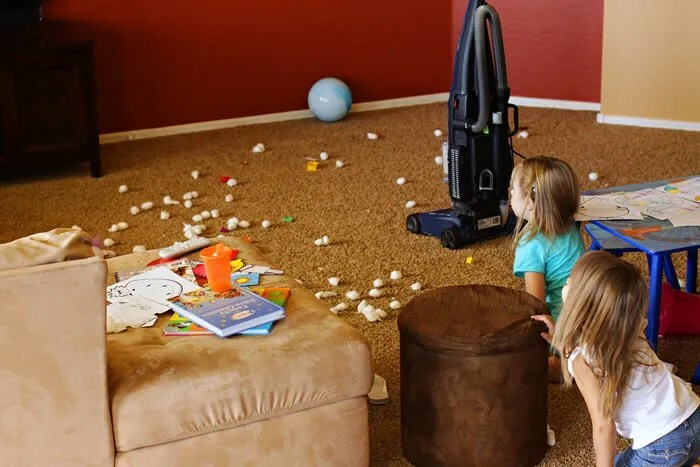 There was a snowstorm in here and I need to go clean my house! Sierra spends most of her days drunk or high. I was taking pictures during school time today and caught this funky face of Brooklyn’s. She was just talking, not even trying to make a silly face. And this is totally random but we all tried writing/drawing with our toes today. Not for any reason besides wondering if we could. I’m not yet tired of the weekly movies! I am tired of taking a picture at the theater every week. Sorry my blog has been a bit boring the last few days. I’ve been taking a lot of pictures but they’re all of our homeschool unit this week and so they will all go in one big post. We’ve only done about half of the things planned for the week and I’m already at 36 edited pictures! How in the world am I going to create a post that doesn’t go on forever?? 36 pictures and many more will be taken! Yikes! I better do a lot of storyboards or something! I have still been doing videos as well but today when I went to upload them to my computer I dropped my memory card in my cup of water, dang it! I’m going to wait overnight for it to dry out. Hopefully it still works! This is why I bought baby gates. 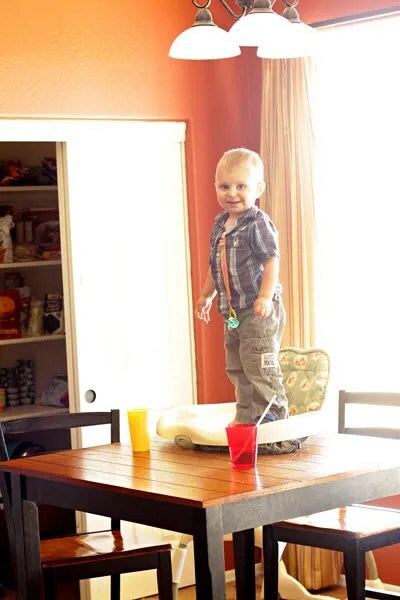 This is why Payson is not allowed in the kitchen unless he’s buckled into his highchair. Any time I let him in the kitchen area (usually when all of us are playing in the family room) he climbs onto the chairs. I tell him no and put him on the ground every time but he still tries and tries and tries. This is why I typically lock him out of that area! Ugh! He falls at least half the time, which is luckily not very often because he’s locked out. Oh and the only reason I finally took a picture of it was because I was taking a picture of a homeschool game we were playing and he climbed up there while I still had my camera in hand. I’d never take even a few seconds to get my camera to photograph this! And lastly, do you see his expression? No matter what I say to him or even if he gets a timeout for climbing up there he thinks he’s so cool for getting up there! Allan is so good at playing with the kids. He comes up with so many fun ideas and adventures. 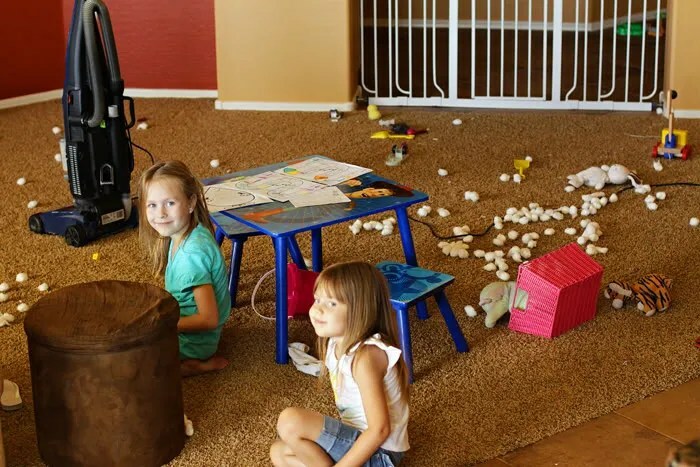 One time he set up the girls’ play houses to look like a mountain (covered in blankets) and the mountain lead up to the top of the closet where one of their toys was held captive in a cage made from one of Payson’s toys. 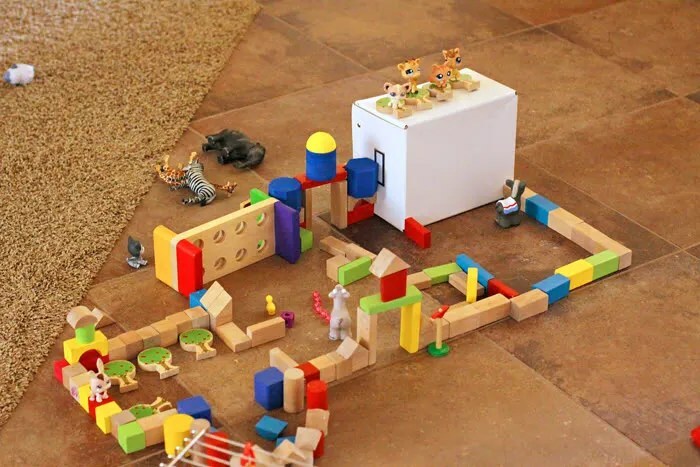 The rest of their toys had to go on a long journey up the mountain and fight an evil witch to save their friend. They had such a blast playing that game. 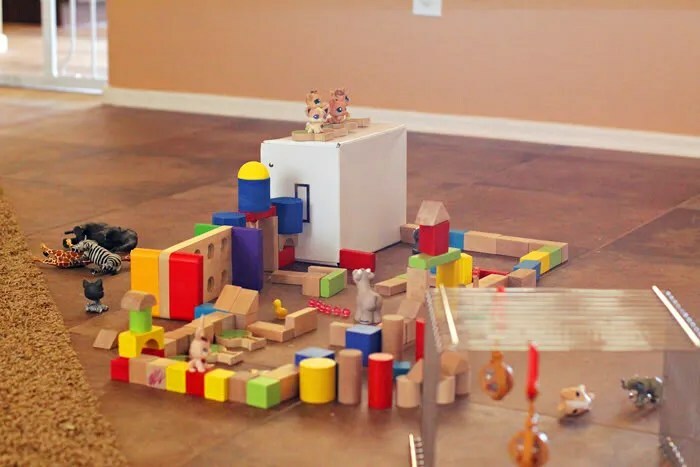 Today while I was finishing up this week’s school unit in the living room, Allan was making this house with the girls in the formal-dining-room-turned-play room. The girls played with it for such a long time and cried when it was time for bed. The only thing that made it better was when Allan told them he’d help them remake it tomorrow. Sierra doesn’t like public restrooms much. I can totally relate, I get really moody when one of my kids calls out, “I have to pee!” while shopping. They’re just gross, gross, gross. Sierra hates the sound the toilet makes when it flushes. She covers her ears every time. She also hates how hot the water in the sinks gets. I don’t think it gets very hot, personally, but anything above room temperature is scorching for sensitive Sierra. She will try several sinks before she finds just the right one. And paper towels, she can’t figure out almost all paper towel dispensers. And hand dryers or whatever they’re called… oh boy does she hate those! Total weirdo in the public restroom, that’s my Sierra. Isn’t it funny how as a kid you can dance in public without a thought in the world to those around you watching? 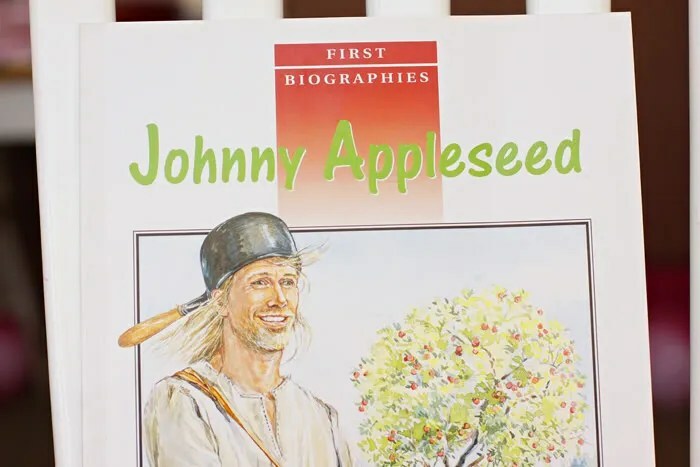 I had a hard time not bursting out laughing during storytime today when the kids would get really into the songs and finger plays and stories. They got some stickers and Sierra immediately stuck hers on her face and arms and wore them like this for the rest of the time we were out. We are a bunch of prunes right now. We spent most of the day in water out in the blazing sun. The water tricked us into forgetting it was 104+ out which is a very, very blissful thing indeed! We went to the pool for the first time in, oh, 3 years! Payson’s never been at all and oh boy oh boy was he in love! He splashed and kicked and jumped and grinned the whole time! Total water baby, that one! The boy is crazy in love with the girls’ flip flops. Maybe I should get him some of his own. As if the pool wasn’t fun enough we set up our new ($5!!) slip n slide when we got home. All three kids did their best to slide down but Brooklyn was the only one who eventually figured it out. And these two do, too! I made another video today… I’m impressed with myself for keeping up with this new project! As well as the picture a day of the kids and me. I figured since I’m making these videos I might as well post them so here is today’s! *Brooklyn was on timeout because when it was time to go in (despite having 10, 5 and then 3 minute warnings beforehand) she screamed NO to me and ran off. And yes she screams that loud every time she gets a timeout. And for about five or ten and sometimes even twenty minutes straight. Timeout doesn’t start until she is calm! Where Did That Crazy Child Come From? I really have nothing to share today because I spent my day deep cleaning my house and deep cleaning is not a very interesting thing to take pictures of!